With a tri-toon this comfortable, why would you ever want to go home? Hey! 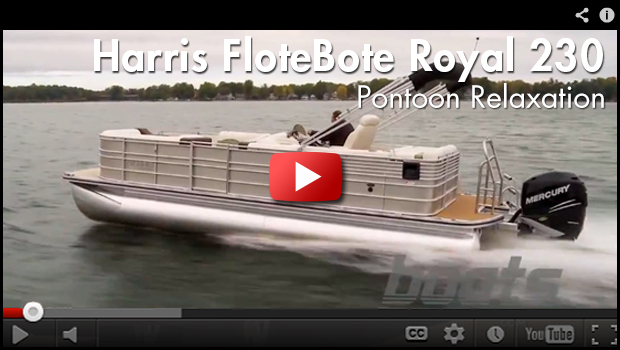 We're here today to test the Harris FloteBote Royal 230. 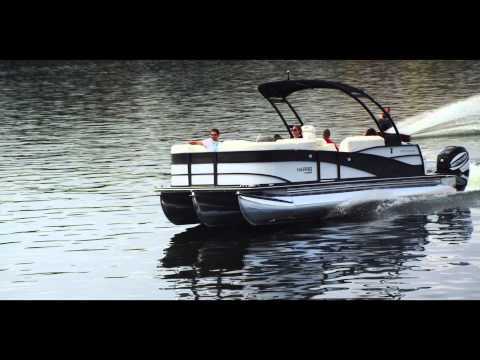 Usually when I test a boat, the last thing I want to do is quote the manufacturer's catalog. But in this case, Harris has one line that just can't go unmentioned: they say that on this boat, relaxation is front and center. Well, I've just got to say 'bulls-eye'. Of course, relaxing is a lot more fun after a thrill or two. And with 225 Verado horses bolted onto the motor pod, the Royal is ready to provide some thrills.An important element to remember is that the Royal has the T3 performance package. Now, what that means is that the center tube is only dropped down about an inch below the outer tubes. 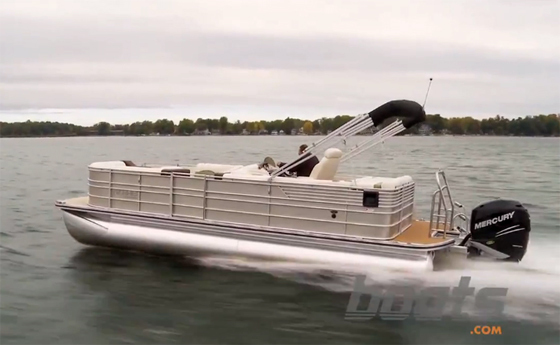 As a result, the boat doesn't have quite the same deep-v handling that some other tri-toons do, but it really improves the speed. In fact, with 225 horses we broke 46 mph. 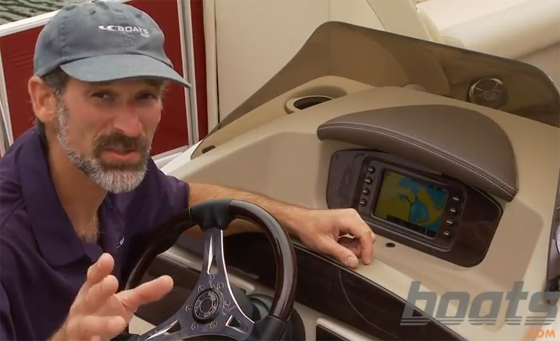 Another important design feature that Harris has is belowdeck skirting. This reduces the friction between the water and the cross-members. 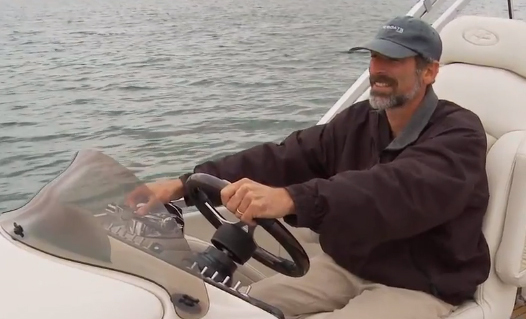 On most boats those cross-members are exposed, and it creates a lot of friction and slows the boat down. While cruising at 4500 rpm, we did just over 26 mph and got 2.8 mpg. That was fun - now let's get back into relaxation mode. 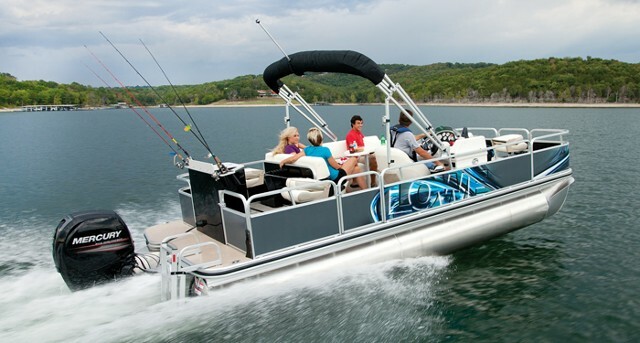 Say it's a hot sunny day, and I want the Bimini top up. All I have to do on this boat, is press a button.Of course, you've got to have cold drinks for a hot day on the boat, so they put in a fridge.And let's stick with the relaxation theme for a moment longer. Pull out your footrest, kick your feet up, and at the same time get even more stowage. I like having these hard surfaces but if this were my boat, one way I'd see to improve it would be to add a snap to this end because it moves around quite a bit. 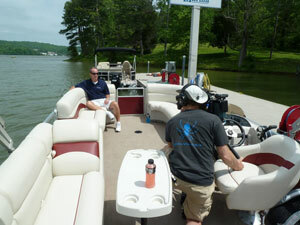 Now, one of the things that cuts into your relaxation level on a lot of pontoon boats is the changing room. They're often really tight and cramped. Not a problem, on the Royal. Check this out: they outfit it with a nice, big, roomy changing room. 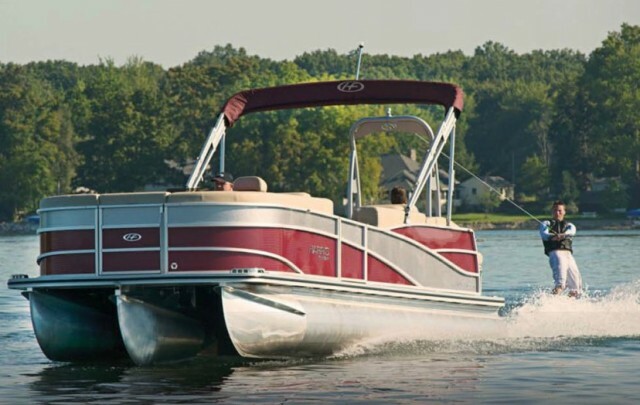 If you like listening to music when you're on the water you're going to love the standard stereo that comes with this boat. Not only is there a radio, there's even a place to plug in your iPod. The Royal 230 also comes with a standard 5 step ladder, and that makes it much easier to get out, and there's an optional tow bar. Q: So Mark, I notice this fabric has a really unusual feel to it. A: Yes, it's a textured vinyl with UV protection that protects it from sun damage. Q: I like how you integrated both a chill box and a refrigerator in the console. A: Right. With fiberglass, it allows us not only to provide the structural integrity, but also a lot of design concepts and customization. Q: Another construction we've been discussing is this gate stop. Mark, can you tell us what's special about it? A: Right. 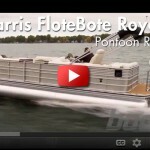 Harris Flotebote uses a patented full-length gate stop, that provides over 400 pounds of resistance. Others just use a small latch. 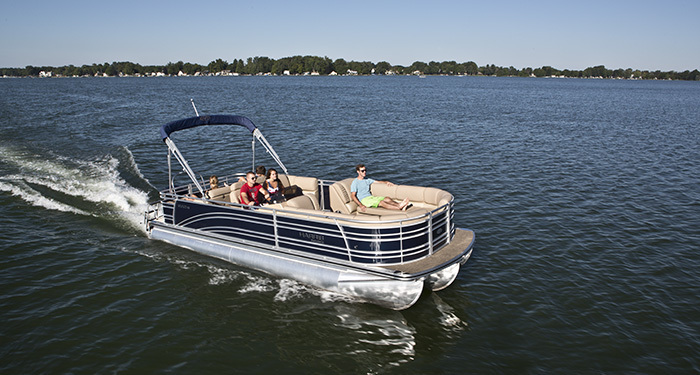 You know, there's only one problem with having a boat that's this comfortable - at the end of the day when it's time to go home, and sit down on the couch, who would want to?